Some of us are okay with who we are in the saddle. We don’t question the ride, or if we do, we put it on the horse and he’s fine with that. It is what it is, and it works for lots of horses and riders. Some of us pause in the saddle; it starts with a small moment of awareness that there might be more possible. Maybe you are crossing a log and you feel your horse lift his back. Maybe in a canter, there’s a moment of body-to-body unison that hooks you in the heart. Or maybe in a blind or uncertain moment, your horse moves under you and offers more, when he didn’t have to. And then the air feels richer. It’s a wake-up call and in that instant, there’s a shift in perception; a teasing glimpse into a hidden place. I think it’s horses that call us there, but it’s our choice to listen or not. It’s the threshold where things get complicated for our species. At one extreme is a desire so hot that we fight and try to control–dominate–a horse’s magic. On the other extreme is a whiny envy without action; a fierce fairy-tale prayer that our horse will do it all for us, if we just give them treats. I’m particularly interested in what it takes for riders to progress; what we have to do mentally to go from being a passenger to a true partner. In the best sense, it’s the transition, beyond fighting or dreaming, to an honest connection. I know; flowery words. For a novice rider, even one who’s ridden for years, the reality is that we get the ride we ask for. If we want something more, we are the ones who have to change. So we try to do more–we kick and pull and things get immediately worse. The harder we think the work is, the harder we ask. Not always with force; more often with micro-managing doubt. We think too much. Even if we know that somehow less is more, we try so willfully hard to do less, that our horses wish for a whip… just for clarity. Our desire just looks like dense fog to them. We are limited by the extra layer of false gravity that we create; we make it harder to accept our own worth because we are always looking at what’s wrong with us. What if the real meaning of improvement was letting go of being our worst critic in our own mind? We are a species who thinks we can control outcome. We like to focus on what’s wrong, immerse in those problems, and then make them right. Even with good intentions, it’s a negative approach. Let me be very clear; attitude doesn’t create a balanced riding position or correct bad hands. Your horse cares about those technical qualities and so should you. But if I could give riders a gift, it would be a suspension of disbelief. “The term suspension of disbelief or willing suspension of disbelief has been defined as a willingness to suspend one’s critical faculties and believe the unbelievable; sacrifice of realism and logic for the sake of enjoyment.” –Wikipedia. Suspension of disbelief is a cue to your inner demons to just shut up; a half-halt to give us a chance to prove to ourselves that we are enough–until WE believe it. 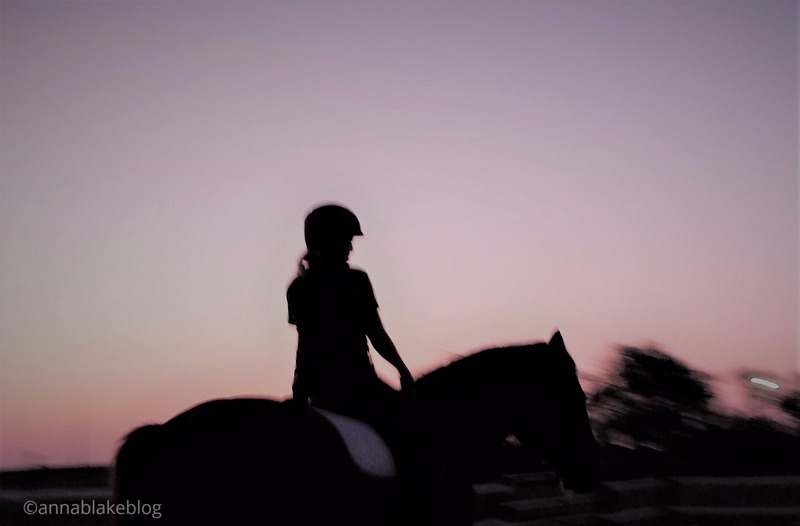 A suspension of disbelief would be a perfect moment when your rider to-do list gets extinguished by a dance where your horse freely lifts you and holds you in the light. Oneness is not a destination you can chase down. It’s something your horse has already, but you have to sit quietly enough to notice and then claim it for yourself. Maybe when riding, the best thing to straddle is that line of possibility, with one foot deeply grateful for all that the two of you have shared together, and the other foot holding a space of absolute wonder. Good riding is naturally uncertain ground; that’s why riding is an art. How can you tell you’re on the right path? It becomes forever less about you and more about doing the best for your horse. To truly put your horse first is much harder than it sounds; it requires a humbling level of honesty that will be fact-checked by your horse. He’ll let you know that humility and insecurity are not the same thing at all. Humility is a place of openness where a horse and rider find balance. The other word for that is grace.